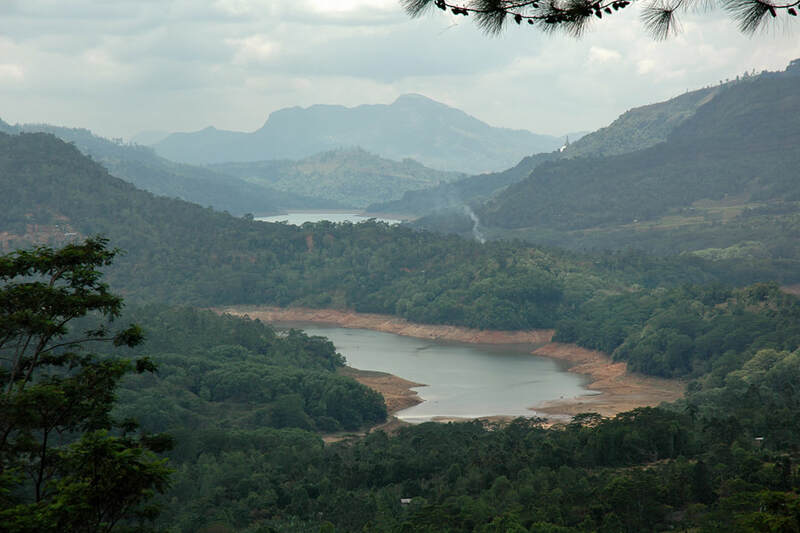 Travelling from Kandy to Nuwara Eliya, you will pass the hamlet of Ramboda, 50 km to the south of Kandy and 25 km north of Nuwara Eliya. Ramboda and the nearby Tawalantenne village, situated in a height of almost 1000 m above sea level, are a perfect place for a break. 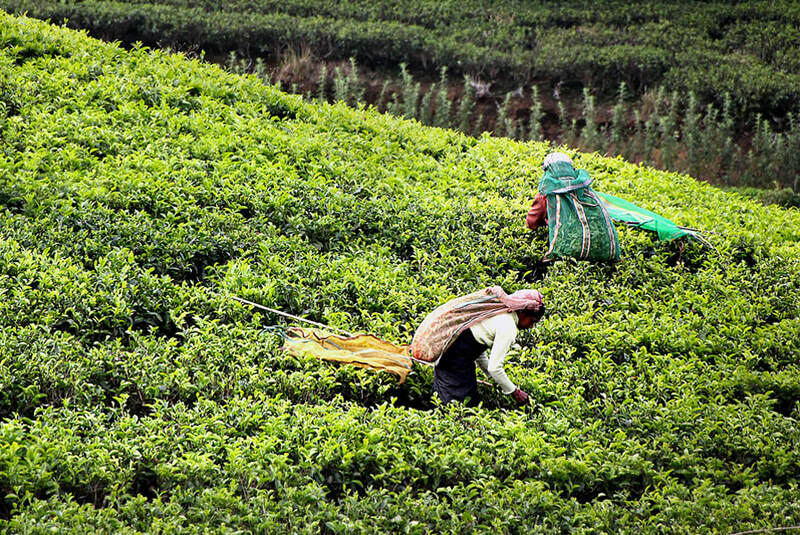 Many restaurants along the road have magnificent views to the reservoirs of the Kotmale valley and to waterfalls within the tea-growing area. One very popular place for a lunch or tea break is Ramboda Falls Hotel. It‘s close to the Ramboda Bridge, but situated a little bit hidden further downhill. Ramboda Falls Hotel has a large garden and restaurant area. Outside guests are welcome to take meals or just enjoy a cup of Ceylon tea. Not surprisingly, the hotel restaurant area offers perfect views to the nearby Ramboda Falls. Be aware, there is more than one waterfall near Ramboda, and almost all of them are called Ramboda Falls. Ramboda Falls in the narrow sense of the word is that in the garden of the hotel of the same name. It‘s created by the Ramboda Oya, Oya being the Sinhala word for „river“. Ramboda Oya forms three falls in a row, two above the mainroad (A5 highway) and one below at the hotel. 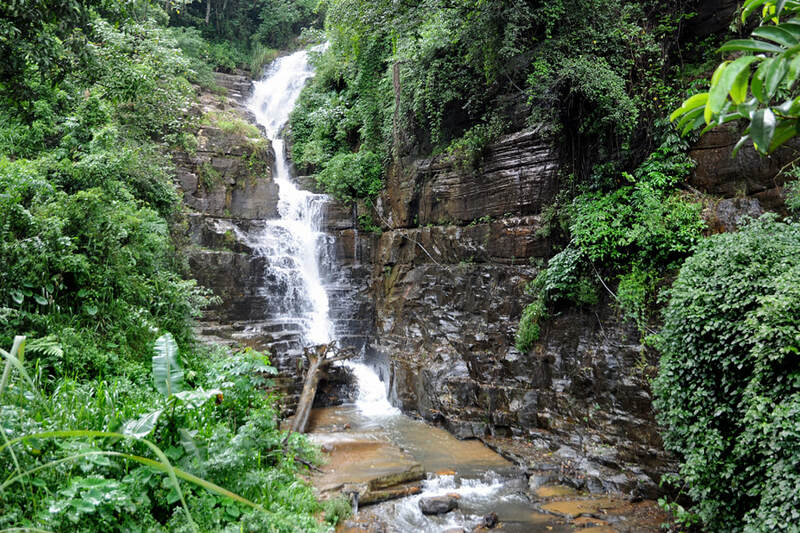 The first waterfall is called the Ihala Ramboda Oya Ella, which translates to „Upper Ramboda Oya Fall“. It‘s in 500 m distance from the mainroad. The „Middle Falls“, Ramboda Oya Meda Ella, can be seen from the main road, the are less tall, only 5 meters. Rhe Pahala Ramboda Oya Ella or „Lower Ramboda Oya Waterfalls“ is 15 meters tall and lies in the hotel garden, about 500 meters downhill and not visible from the mainroad. Even more confusing: The three falls of Ramboda Oya are not the only waterfalls called Ramboda Falls. The tallest waterfall and the only one visible from a far distance is 1.5 km behind the Ramboda Falls Hotel and closer to the Ramboda Inn and Blue Field Tea Factory. 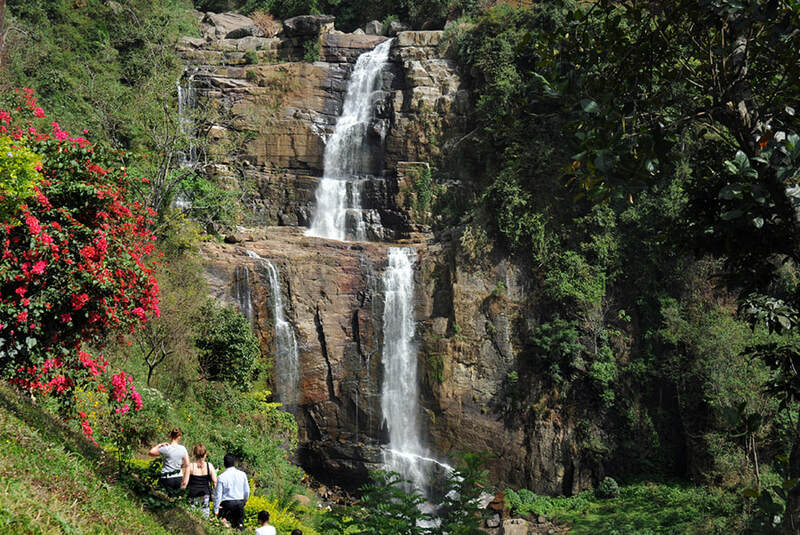 With a height of 109 m, it‘s counted as the 11th tallest waterfalls of Sri Lanka. The correct name is Poona Falls (also spelt „Puna Ella“), as it is created by the Poona Oya, a tributary of the Ramboda Oya and the Kotmale River. Poona Falls in Ramboda is known for its Y-shape. Indeed it‘s created not by a single stream but by two different streams. The waterfalls are the place of their confluence. Thus, “Poona Oya Ella Falls” is actually a twin waterfall.To be more precise: The fall on the left side is the true Poona Ella, whereas the fall on the right side is created by a separate stream, the Pundalu Oya. 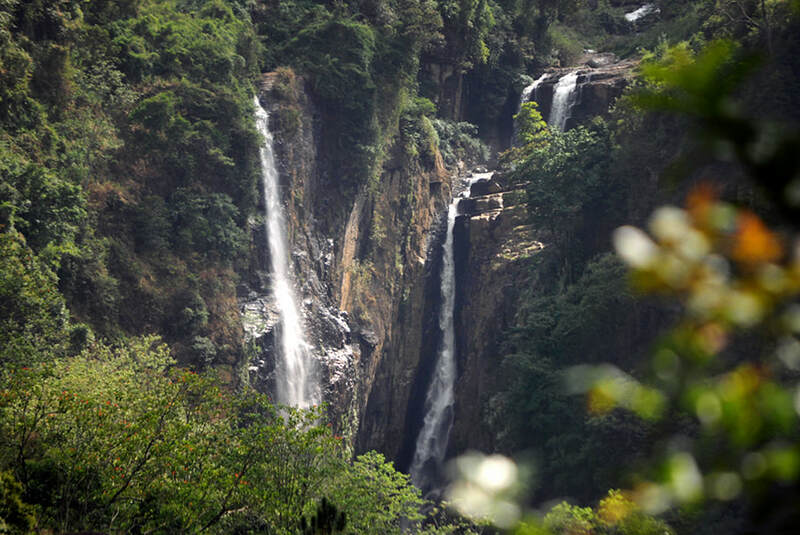 Thus, the correct name of the tallest waterfalls in Ramboda would be „Pundala Falls“, as most of the year the Pundalu Oya carries more volume than the Poona Oya. But during the dry season, the amount of water of the Pundalu Oya decreases much more than that of the Poona Oya. So let‘s continue to call it „Poona Falls“, during the dry season at least – or Ramboda Falls, as most tourists do. The various waterfalls mentioned above are by far not the only ones in the Ramboda region. Hellboda Ella is another impressive one not far from the mainroad. More waterfalls further uphill can be seen from far distance, when driving the most scenic part of the mainroad just behind Blue Field Tea Estate. According to the local legends, Ramboda is an area, where events of the Indian Ramayana epic took place. When Ravana, the King of hanka, had abducted Sita, he flew with her through the air to Lanka, using his heavenly chariot, the Pushpaka Vimana. Eager to win her love, he tried to impress her by showing her the beauty of his kingdom. So he flew over a region of splended waterfalls. And this region of course must have been Ramboda. Another story has it, that Hanuman searching Sita came along Ramboda on the way to Lankapura and Ashoka Vatika, where Sita was held in captivity. Ramboda is also said to have been the place where Rama, Sita‘s husband, gathered his army before fighting against Ravana to free his wife. 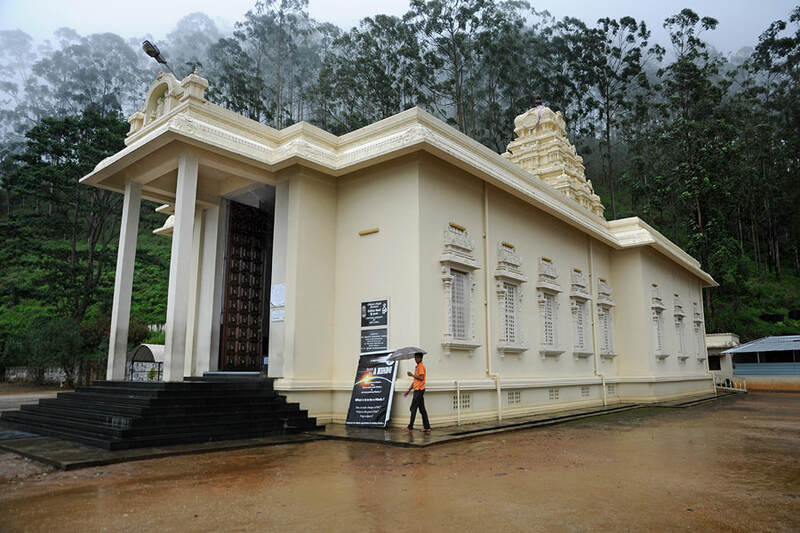 The Hindu Chinmaya mission of Sri Lanka construted a temple dedicated to Hanuman near Ramboda recently. The temple houses for 16 feet high statue of Hanuman. It has become an important place of pilgrimage for Hindus from India.